Graphic and compelling ad campaign in Tel Aviv and Jerusalem. The issue of shipping live animals to Israel from Australia for slaughter is a very painful one and we are working in a variety of ways to reduce it to the minimum possible. You may recall that around this time last year I travelled to Israel to present to the animal welfare committee of the Knesset (Israeli Parliament) about the cruelty and suffering inherent to live animal export. As you know, the journey for Australian animals in particular to Israel is perilous. And that this shipping route underpins the viability of the Australian sheep trade to Jordan… so ending live export to Israel is important on a number of fronts. I was pleased that the members of this committee unanimously agreed that the trade to Israel should end. … The Israeli government is in the process of implementing policy changes which will lead to a dramatic reduction in the number of live animals imported into the country. 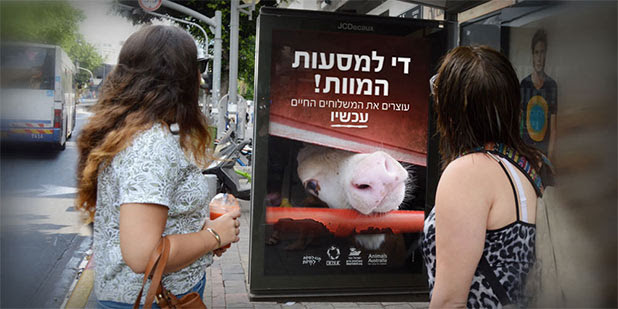 One Knesset Member, Tamar Zandberg, is submitting a bill to ban live imports in March, which will only heighten the political debate about the future of live export to Israel. I would love nothing more than to be able to report back to you soon with a positive outcome. But I don’t underestimate the challenge ahead. We know that the closer we get to achieving significant change for animals, the harder those against us will fight to maintain the status quo.